Hi! It’s Kylee here today! I know I’m long overdue with an update on our move to the townhouse, but between working, taking care of Bella and unpacking boxes, getting settled has taken a bit longer than I expected. The last time we moved I’m pretty sure we didn’t have nearly this much stuff! We also had a little incident trying to get our old leather sofas up the narrow staircase to our second floor living room. I was kind of hoping to use that as an excuse for buying a new sofa, but my husband Lance was determined to salvage them. So, he came up with a plan to hoist the bulky sofa up over our balcony and into the sliding doors on the second floor of our townhouse. Good times. I have all the ridiculous photos to prove it, so I’ll share that tale and how it all turned out in my next update. Meanwhile, I thought I would share a quick update to our main floor powder room! This tiny little bathroom is perfect for guests. Can you believe we have three and a half bathrooms in our tiny townhouse? We do! Our last place was a studio apartment with no separate bedroom and only one bathroom so we feel like we are living the life here! I have been looking forward to updating this little bathroom ever since we bought the house! It is so fun having so many rooms to decorate. 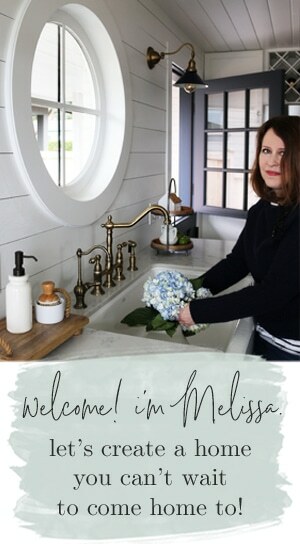 I really wanted to give it a personal touch as well as make it feel pretty and welcoming for guests. Eventually we may decide to do something crazy like install wallpaper or, dare I say it, stencil the walls…but for now we are loving these simple updates! In a powder bath it doesn’t take a lot to make it feel finished, which means even simple updates make a big difference. I started by adding a fresh hand towel, a pretty soap dispenser, and a small bouquet of flowers. 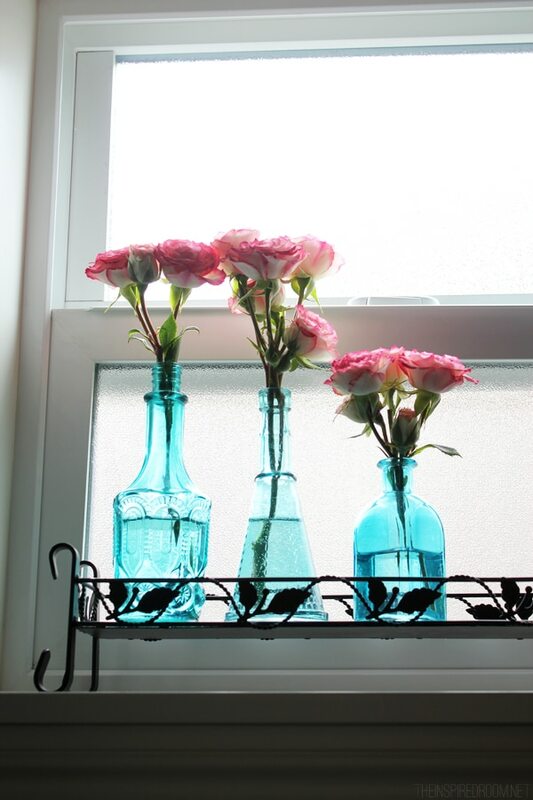 I’ve collected blue glass vases for awhile now, I think they look so sweet with these mini pink roses in them. I couldn’t wait to get art on the walls, but I knew I didn’t want just any art. I really wanted artwork that has personal meaning behind it. 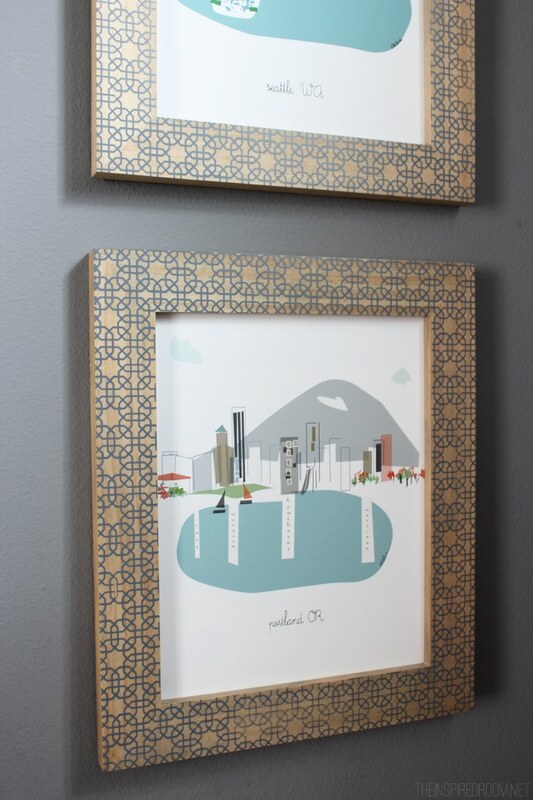 When I found Kim at Albie Designs on Etsy, I loved the entire collection of her city prints and knew I needed some in my house! My husband and I grew up in Portland, and we now call Seattle our home, so artwork that represents those cities is very meaningful to us! If you love these prints as much as I do, you’re in luck, because today Kim from Albie Designs is giving away a $100 towards your choice of art at Albie Designs! Note: The frames are not included, I got mine at Target! The wall color is Seal Grey by Glidden. If you missed the story of our new house, catch up here! 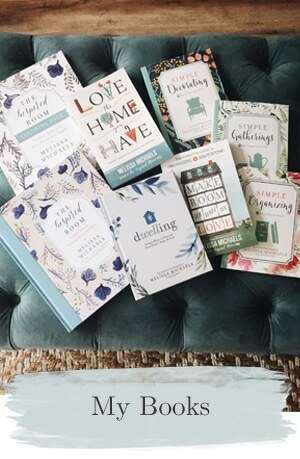 What will you pick out from Albie Designs if you win? Comment below to enter! I’d choose the Paris print. I love her work, wish she had a city print for Indianapolis! The cityscapes are wonderful, but mine isn’t there. I DO love, love love the “Simmer Down” in black & white! Lovely! Portland, OR for sure; my husband and I spent two amazing years there! Although we are North Carolina natives, Pdx will always feel like a second home to us! What is the paint color in this powder room? It’s great. I love Albie Designs’ Philadelphia print! Thank you! It’s called Seal Grey by Glidden. My husband is from Seattle, he would love this! My sister loves New York City so I would have to get that for her! I ‘need’ 3 city prints, actually (I’ll spring for 2 if I win 1!) . . . a St. Louis, as that’s my homeland (go Cardinals!) . . . + 1 each of St. Paul + Minneapolis. Our daughter, husband + 2 adorable grands live there, + we’re visiting in about a week. I’m all about the ‘just because’ gift, + I have a ‘thing’ for city memorabilia, too! Kylee, you powder room is sweet! We are re-doing ours + just finished painting it almost the exact, same gray you chose! Fun X’s! These prints are very unique & so adorable! Love them! Look great in those frames too :). I’d go for Phoenix Az, probably! I’d love the DC one, and I’d get the Chicago print for my sister. So cute! forvorate cities to visit. I prints give a modern look at the landmarks of the cities. I love the color in the powder room. I love the Paris print. I love these. I would have to top it up. I would have to get some for the places my husband and I lived before we had kids and then some for where the kids were born — so London, Oxford, San Francisco, Tulsa, and Oklahoma City. I have seen her etsy store before and want the Dallas print!! I would have to have the Eugene, OR. to remind me of my family as I now live in IN. I would also have to have the New Orleans… That’s where my hubby & I of 13 yrs. went to get married. We had such a wonderful time fishing and sight seeing !!!! It’s amazing how the room packs such a punch with so little. The pictures are perfect for the space, and I love the colors! I love Kim’s work! I’ve been a fan for some time. While I’m waiting for her to do an Indianapolis print, my choice would have to be either Minneapolis, where I lived for 10 years, Chicago, or Austin, where I have family. I love all of them. My favorite would be Paris, Florence, or Venice. It’s hard to pick just one. I love DC and Paris! I’d love a Boston print, since we recently took the kids there for a ballgame. Kansas City or St. Louis, we just went to both on our summer road trip! I would love the St. Louis city print and the Let’s Unwind print! I love these prints! I would love one of Minneapolis. My daughter just moved there. It would be a perfect Christmas gift. My husband and I unfortunately are living “A Tale of Two Cities” as we are forced to live apart for the next three years. I would LOVE to own these city prints of Kansas City and New Orleans! Looking at them over the years would be a gentle reminder of our time apart and inspire us to always cherish our time together! I would love New York City! I want the Austin print! I would put in in our den bookcase. Love it! if you ever do Raleigh NC that is home and a beautiful city! all of these are fabulous but Paris and Florence are close to my heart and my brother lives in San Fran and would love these too! Would love a Seattle or a Tacoma, WA print. Thanks for the chance! So fun! I love them all! Chicago and New Orleans are amount my favorites! 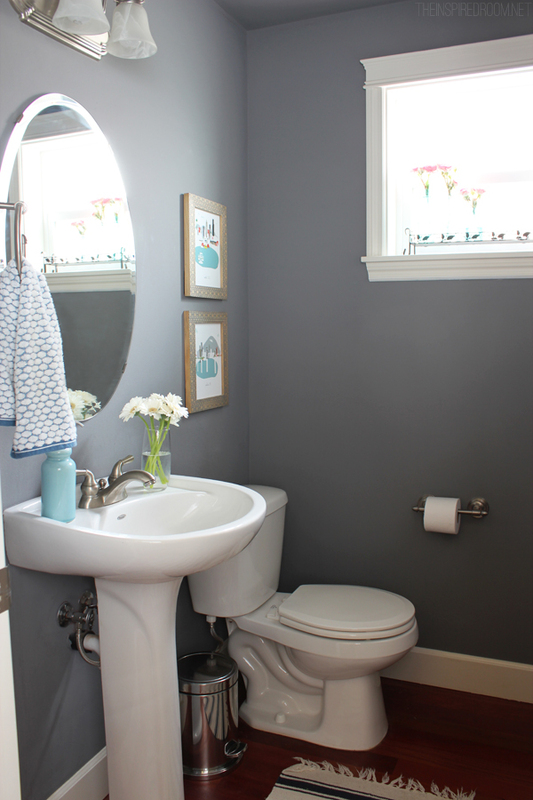 I love how this powder room turned out! And the gray walls are fantastic! If I were to win I could get this San Francisco print. My husband and I lived there for a time and fell in love with the city. I would choose New York or Chicago. We’ve lived in both places. So cute and they look lovely in your powder room. NJ and NY – my heart is caught between the two, but I do love being a Jersey girl! Great, great prints!! Love! My wife and I have lived many places. She would love a print from any one of these places or ALL of them! Being a Minnesotan, I love the Minneapolis and St. Paul prints. they all looked fun, but I really liked the dancing queen one. it would look beautiful in my girls room. Would love the Denver print! Love these! Would likely pick Chicago but I love them all! Cleveland! We love living here by the lake. I love the color of the walls. I would choose Seattle, my home for the last 35 years. Your powder room turned out great! I would probably like the Chicago print. Hotlanta. Also wish she had Memphis. Or Honolulu! I love the Brussels, Paris or Florence ones!!! I might get all three!!!! Thanks for the giveaway! Love the blue vases!! I would pick my hometown, Cincinnati, Ohio!! Love these! San Diego for my husband and me, Seattle for my son-in-law. Any chance of one from Kodiak, Alaska?? Congrats on your new townhouse! I would love the Paris print! Grew up in Chicago-would have to pick The Windy City! I would love Madison, WI! I am actually going to buy it for a good friend who grew up there. What perfect gift ideas! I love the Chicago one and would definitely purchase the Tokyo one for my brother and sister-in-law. I would love Minneapolis and St. Paul. Paris always calls to me =) Cute little bathroom…love the blue jars…and the simplicity of the room. Chicago! And what color is the paint? Thank you! Looks beautiful! lettuce eat and simmer down! It’s a tie between the Atlanta print and the “Let’s Unwind” one. These are so fun! They are all so creative and beautiful. I’m all in for Chicago, New York and Paris! A girl can dream, right? My parents anniversary is coming up and I would love to get some prints from where they met, married and are living now. These are great gifts for everyone, will be purchasing some for sure. Thanks! Just ordered the Denver one for my step daughter for Christmas! Would love the Minneapolis one for us! Those city prints are adorable! And I love the frames. I think I would order the San Diego one as that is where my husband and I met and were married. Thanks for sharing! Very cool! Would love to see a Cleveland! Paris…a place I dream of going one day…that be my pick for now!! I love the “lettuce eat”, “let’s roll” and “let’s unwind” prints! Fabulous! I’d have a difficult time choosing between Paris, Venice and NYC! Too bad there is not (yet) one of Toronto. I would definitely pick up Seattle! I am loving these neat prints! Love all the ones of cities we visited while we lived in Germany, but we live in DC now so that would be my pick. Thanks so much! I want the Los Angeles one because that’s where I just moved from and both of my boys were born there. Then I would probably get the Portland one because that is where we moved to. Two of my favorite places in Europe were Bruges and Cinque Terre, so maybe those or the Eiffel Tower? So many good ones to choose from! Portland or san Francisco prints for my kiddos! these are adorable! Love how she captures the essence of a place! Love the creative prints…contemporary, chic, cool! It would be fun to “Unwind” gazing at one of her prints. I would pick San Deigo, my daughters favorite place to visit! New Orleans, Chicago…. what wonderful gifts these would make. I am eyeing things up for those I love! Awesome! Pick me, pick me! The bathroom looks great, by the way! I would choose her “any city” poster of my town Santa Barbara! Thanks for the chance! i love those frames. i was looking for a pittsburgh print, and almost bought one from them but went with another seller. i’d get the eiffel tower, brugge, and london since they are some of our travels. i love the london and champs de elysee prints! I love these prints! I would definitely get pdx and seattle since we lived in both places! But I also love the cinque terra and venice ones for another room. I’d pick Minneapolis! Thanks for sharing her work — very fun — and I’d never seen it before. What an adorable shop! Instead of Atlanta (where I live), I think I’d choose dream destinations like Venice and Paris and Florence. What a great giveaway! I would choose the Charlotte print. My husband was raised there. Love her stuff, but I’ve been eyeing some of the food prints- I think they’re so cute and clever! Thanks for offering the giveaway! I really like the ‘simmer down’ and ‘let’s toast’ prints. They would be really cute in my new kitchen! The Boston print is terrific! I would have to have it as well as a custom print of Birmingham, AL – my home town. And the “Lettuce Eat” print would be the perfect choice for a spot I have in my kitchen. would have to pick chicago and maybe denver! This inspires me to tackle our bathroom! I love that you have a small window to bring in light through the blue vases! I have been admiring these prints for a while! I would pick Milwaukee! I had a very small 1/2 bath in a house we owned and it really doesn’t take much to spruce them up. A coat of paint, prints, and a shelf for a few nice accessories is all that is needed. Love the color of your walls! What a cool shop! I purchase a lot of prints from Etsy and have never found this shop. Thanks for the heads up. I really like the Paris Eiffel Tower Print. The bathroom is great & I love the prints!! I would choose Manhattan, and Paris!! but I love them all!!! Thank you for sharing!!! I’d definitely choose London (where Hubby & I met while studying abroad there in college). If she made Nashville, TN, I might pick it, since we just moved away from there and miss it tremendously, but I didn’t see that choice, so London it is! I would choose Los Angeles because I grew up there and that’s where my husband spent the majority of our pre-marital/dating days. What a fun way to capture the city’s essence! SF, Portland, Chicago, Madison, New Orleans & missing Park City UT & Pensicola, FL!!! I see Phoenix, Minneapolis, but I do not see Nashville, and well….. Flint will never make it. All places we have lived. My son loves St. Louis every time we drive through it. Soooo many choices……. OMG! These are so cute! We live in Richmond, VA and being a smaller city I didn’t think she’d have it! I’d get that one, Atlanta where my boyfriend is from, and Nashville for my brother who lives there now. AHHH. So many cute prints! Since they don’t have Houston, I would get London or Paris. I can’t believe you have Milwaukee! Yea! i live in denver so a natural fit would be the denver print from albie designs. however, i also think her ‘simmer down’ or ‘let’s roll’ prints would be a fun tongue and cheek addition to my kitchen. Wow! I love the Washington DC print. I’m from DC and my whole family still lives there. I currently live in LA and get homesick a lot. That print would look just perfect in my Cali apartment! Would love a Nashville one! These are so great! I like the Cincinnati one, but the style is so neat that I could put any of them on my wall. I would either get the Portland and Eugene prints (where I live now and where I grew up) or the Italy prints. I would have to get the Kansas City Mo print for sure. 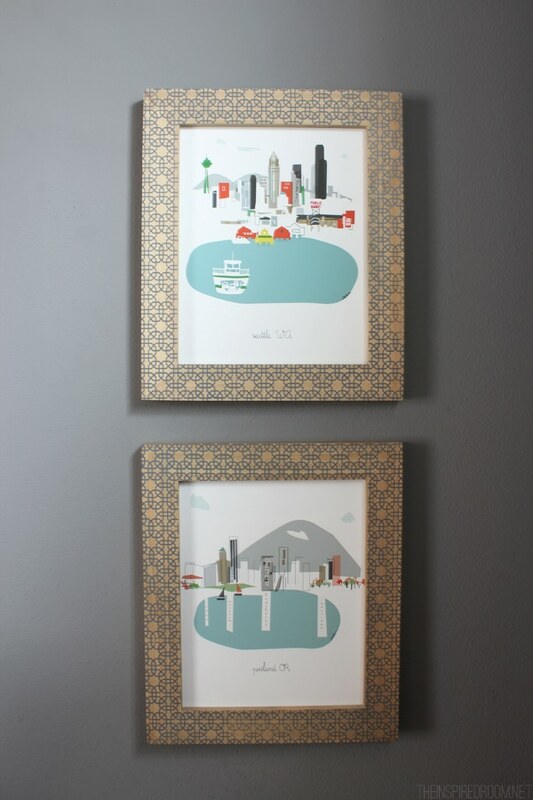 I would definitely choose Salt Lake City and Cincinnati, the prints are adorable and so are the frames!!!! Seattle – I’ve lived here all my life. Love her work! Love it! It is something about tiny bathrooms that really excites me. I think it is because they are sometimes a decorating challenge and the designer in me is always looking for a challenge. Great space and great job in decorating! Thanks for sharing! I’ve been a fan of Albie Designs for some time – such great designs! 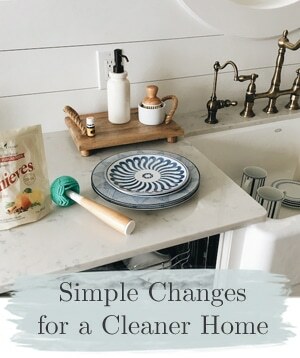 I love her Paris prints and the Kitchen print entitled “be grateful”. Thanks for such a wonderful giveaway! I love the Los Angeles print! We are moving in one week to Los Angeles and I would love to hang this print in our new house!! The Madison, Wi and Philadelphia, PA prints!! Our sons live in those two cities!! These are fabulous! We live in a small city in SC, but I’d get my sister the Boston print!! Thank you for sharing – I love finding different and fun artwork! Would love to have one of Ft. Worth! If not, perhaps San Francisco, New York or New Orleans ~ other favorites. Also like the black & white “Let’s Unwind”. Since we now live in Texas, I would pick Austin and /or Dallas..but Los Angeles would be on the list too! I love the Simmer Down prints, both the b&w and the yellow one! I say that all the time and they would be perfect in my kitchen! Very cute prints! I love the Boston, Tokyo and simmer down prints. We live in Boston and when our dear friends moved back to Japan, my son and I visited and have great memories of Mt. Fuji, Tokyo Tower and Ginza. I always have a tea kettle simmering, so that print would be VERY approprate! Thank you for the opportunity. I didn’t see a print of Indianapolis, IN, but perhaps if I send her a pic of downtown (particularly the Memorial Monument) she could make one! Also, the child’s artwork was adorable – and perfect for my little one’s room! Your little powder room is adorable! My husband and I just bought our first house as well, looking forward to seeing more posts! I’m from Portland, so I would definitely go with the Portland and the Autzen Stadium one :) Go Ducks! I would choose the Washington DC one since it reminds me of family vacations we took to visit extended family every summer when I was growing up. I really wish she had a Nashville one though-TN girl born and bred, although I am a SC transplant now! I would choose the Phoenix print as well as try and get a print of San Antonio…those are the two cities that my kids were born in! My daughter has lived in France, LA and Dallas. She will have to choose, or maybe not!…all are adorable! Dancing queen for my grandaughters bedroom. Cinque Terre and Florence… some of my fondest memories of traveling through Italy. I love how all the prints from Albie Designs really capture the uniqueness of each city. If I understand her offerings correctly (the any town option) I’d choose Columbus OH or Gahanna OH. 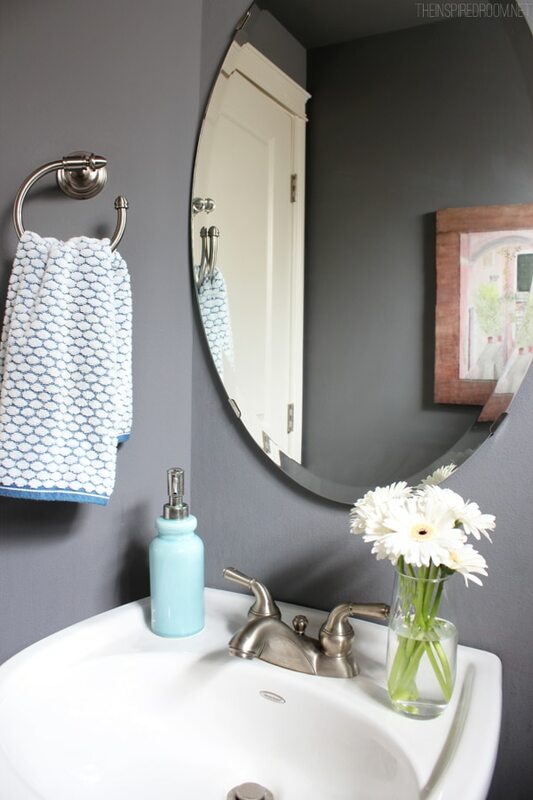 Love love love the quaintess of your powder room… The prints are perfect! Oh my goodness! I just love the St. Louis artwork, so cute! I would definitely choose the beautiful Pittsburgh print for my hubby! Portland, Oregon born and raised. Those are so awesome and would make awesome gifts. I’d choose city prints for our hometowns. I’d have to go with Seattle! Unless of course she would do little old Poulsbo! Thanks for the chance to win. I love San Francisco. My bathroom already has a “cities of the world” theme. I have prints from various cities on the wall and each season I like to switch up some of the picture(s) to showcase a new city. Currently on the wall is “Berlin” – my favorite city (that I’ve been to!). It’s printed on a dark mustardy yellow so it looks nice for fall. I recently had Istanbul over the summer. So I would be thrilled to own ANY of the city prints, but I would probably choose one or more among: Dallas (where I grew up), Boston (where I live now) or Cinque Terre (where my husband and I vacationed). I’m so glad to discover these prints! Perfect for some of my Christmas gifts. I really like your powder room too, and am eagerly awaiting the couch-hoisting pictures! I love the Paris and Chicago prints!! Great blog today! I would have to pick the Sydney print, gorgeous representation of the city! I would love to have a print of a city from Maine, however, she doesn’t have any….yet, but hopefully she will. I also would love to have one from Canada where I am from. Possibilities are endless. Very cool! Great representation of Seattle. I’d love the Chicago & St. Louis prints. Two beautiful places I’ve lived! Also sheer did you get the cute blue soap pump? I need for my powder room! If I won the Albie Designs contest, I would be thrilled to get a large print of the Los Angeles design. While my boyfriend and I just bought our first home outside of Detroit, our long-term dream is to move to Los Angeles, and we are trying to keep that dream in the forefront of our minds. Having this print hung in our living room would be the perfect reminder of all that we love about California! If she does international cities then my pick would have to be London in memory of the wonderful 16 days my daughter and I spent there before children (hers). Cute prints. I’d choose Saint Louis and Phoenix because my boys live in those cities. I would get the exact ones you have pictured! We are moving from San Diego to Portland and eventually back to Washington. Yay! I’ve only been to a handful of the cityscapes in her prints but I am loving the way London and Sydney look even though I’ve never been to either. I just found your blog and I’m smitten. Your powder room is adorable. Where are your hand towel and soap dispenser from? I also love the prints. I’d go with Chicago, where I met the Mister, and Paris, where we got engaged. I’m from St. Louis so it was nice to see the picture. I love all the kitchen prints! Let’s see, I grew up in Houston (don’t have) but lived in Denver, Chicago, Dallas and now Portland so how could I choose just 1! But, since Portland is my home now, I’d go for that! Simply.Adorable. I would get our favorite cities to visit, Chicago and San Francisco. Love the powder room with the prints. Original artwork is always inspiring. The Portland and Autzen Stadium prints are my favorite. I married a “Double-Duck”, U of O undergrad and law school! They would look great in his office. You have a nice bathroom. What luxury to have 3 1/2 bathrooms after having just one. Can you tell me where you got the hand soap dispenser? It’s pretty! I live in theMinneapolis/St Paul area. I like how Kim used color in her art. Pale pink with ochre yellow and pale blue with beige or bright red. It’s refreshing! I love the wall color. Pictures in the etsy store are super cute. ‘Dancing Queen’ would look so cute in my little big girl’s room and i love the wine cork one for the kitchen. Bummed there’s no Detroit! I’d love to have that and Dallas. I am a Philly girl, so it would be the Philadelphia art piece! I would pick the Denver and Boston prints. I love her watercolor prints as well, it would be so hard to choose! These prints are so cute and really make a nice polished statement about your powder room. If I won, I would have to go for Washington DC. My husband of 35 wonderful years and I met in High School, just outside of DC. We have many happy memories of time spent in the city. So many great prints! Chicago!? London!? Let’s Unwind!? Any of them. I live in the Minneapolis area so that would be great! I love the Seattle one! We live on kitsap. It’s a tough choice for me – love the Paris print – however, we just moved to TX from Boston and it would be great to add the Boston print to my collage wall. These prints are wonderful! I want Pittsburgh (just back from another visit there…a wonderful city if you haven’t been…love it!) Or I would love San Francisco…always a favorite. Cute prints! I would go with Denver (where I call home), Boston (one of my favorite cities I’ve visited), Paris or Venice (where I would love to visit). Thanks!! I love these prints. I’d pick Seattle, Denver and Chicago. Significant places where my life is lived right now. Wish there was a Raleigh (NC) one. I really like the black and white “Let’s unwind” one. How adorable are these???!!! I have so many fave cities, it would be a difficult (but fun!) choice to make. Pittsburgh…my hometown. 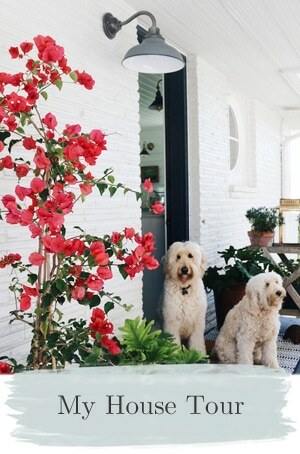 I’ve loved her prints for a long awhile and would love one for my home:). Hope I win. My fingers are crossed. I would pick Paris because my daughter dream is to go there, then San Diego because we all love that city and then Boston because I spend wonderful old days there. I would choose the Washington DC and Atlanta prints. My hometown is Atlanta and I currently live in the Washington DC metro area. I love so many cities around the world, but since I live in Colorado near Denver, I’ll have to go with Denver–it’s a great city! And I love all her prints! I am a sucker for prints! With the right framing they can look like a million dollars! I love portand print. I lived in portland for 20 years. Wow so many to pick from. I could chose so many. I love the Lets Roll-Black and white watercolor print! 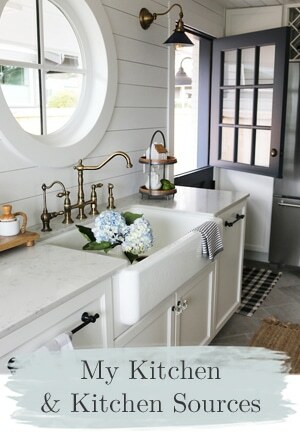 I am loving the Kitchen Prints! Simmer Down and So Grateful are probably my top two but i am also liking the sweet alphabet print. Truly a tuff choice but one I would like to make! I like the New Orleans print. I love the prints of Venice and Cinque Terre! I have been inspired lately to put together a Gallery Wall in my living room on a big, empty section of the wall. I would love to have a few prints to be part of that ensemble! I would get paris and new york city! My husband and I honeymooned in Paris and I used to live in NYC! I would definitely want to get the Charlotte one as well as the NYC ones! They are all so pretty though. I might just have to buy one of every city I’ve visited! 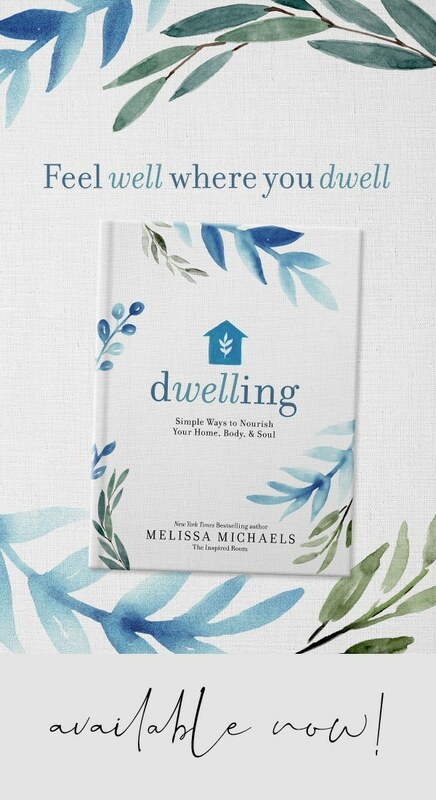 The Portland & Seattle prints would be perfect for me, as well… I grew up in the Portland area, and now I’ve settled in the Seattle area (the west side of the Sound, same general area as you, Melissa). I’m so happy for your daughter & her hub buying their first home, such an exciting time of life, best wishes to them! I’d get Crissy Field, Austin & Let’s Roll. I love her work. I really like the Unwind prints as well as several of the city prints. Thank you for introducing me to her store.